Home Harkers Duramitex Plus. 200ml. 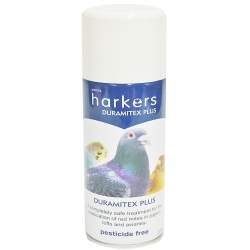 Harkers Duramitex Plus spray is ideal for the treatment for the eradication of red mites in lofts and aviaries. Can also be used on chicken coops. Duramitex plus spray is pesticide free, designed to clear mite infestations in the domestic bird cage or aviary environment. Works instantly to control mites and completely harmess to birds, animals and humans. Easy to apply, with no mess and dries quickly. Powerful control- one application lasts weeks.